The primary goal of dental care is to preserve teeth. But there are circumstances in which removing a tooth, even a relatively healthy one, could prove best in the long run. A malocclusion (poor bite) related to crowding might fit such a circumstance. Crowding occurs when the size of the jaw is too small for the teeth coming in. With not enough space, some teeth could erupt out of their proper positions. Removing certain teeth frees up space to eventually allow braces or other orthodontic devices to re-align the teeth. The teeth most frequently removed are the first bicuspids, located between the cuspid (the "eyeteeth" directly under the eyes) and the back teeth, and the second premolar. Removing these won't normally affect appearance or functionality once orthodontic or cosmetic treatments are complete. Because of the mechanics of jaw development it might be necessary to perform these extractions several years before orthodontic treatment. This could create another potential problem: the time lag could adversely affect bone health. This is because bone, as living tissue, has a life cycle with cells forming, functioning and then dissolving, and new cells taking their place. When teeth are chewing or in contact with each other they generate force that travels through the tooth roots to the bone and stimulates cell growth at a healthy replacement rate. But when a tooth is missing, so is this stimulation. This slows the replacement rate and eventually leads to decreased bone volume. Too much bone loss could create obstacles for orthodontic treatment or a future dental implant. To avoid this, the dentist will often place a bone graft with processed bone mineral within the empty tooth socket right after extraction. The graft serves as a scaffold for bone cells to grow upon. The graft (plus any other added growth boosters) can help maintain a healthy level of bone volume to facilitate future orthodontic or restorative treatments. 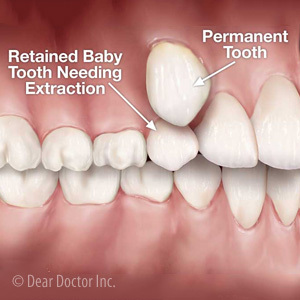 Since targeted extraction for orthodontics is time-sensitive, you should have your child's bite evaluated by an orthodontist by age 7 to see if any action is necessary. The earlier a malocclusion is detected, the more likely a more attractive and healthy smile will be the ultimate outcome.